You'll visit kid-friendly attractions like Aurinkolahti Beach and Hietaranta Beach. 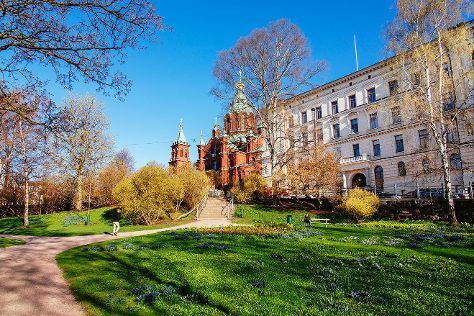 And it doesn't end there: take a stroll through Katajanokka, take in the spiritual surroundings of Uspenskin Cathedral (Uspenskin Katedraali), take in the architecture and atmosphere at Helsinki Cathedral, and make a trip to Senate Square. For reviews, traveler tips, more things to do, and other tourist information, read Helsinki online vacation planner . Bengaluru, India to Helsinki is an approximately 14.5-hour flight. You can also do a combination of flight and ferry. Due to the time zone difference, you'll gain 3 hours traveling from Bengaluru to Helsinki. Traveling from Bengaluru in December, expect Helsinki to be cooler, temps between 3°C and -3°C. Cap off your sightseeing on the 24th (Tue) early enough to travel to Hanko. Hanko is a bilingual port town and municipality on the south coast of Finland, 130km west of Helsinki. Kick off your visit on the 25th (Wed): kick back and relax at Bellevue Beach, take in panoramic vistas at Hanko Water Tower, then steep yourself in history at Pike's Gut, and finally get engrossed in the history at Hanko Museum. To find more things to do, photos, ratings, and other tourist information, use the Hanko trip planner . Drive from Helsinki to Hanko in 2 hours. In December, daytime highs in Hanko are 1°C, while nighttime lows are -4°C. Wrap up your sightseeing on the 25th (Wed) early enough to travel to Tampere. Bring the kids along to Riihiniemen Uimaranta and Hatanpaa Arboretum. And it doesn't end there: soothe aching muscles at some of the top local wellness centers, have fun at Pyynikki's Swim Hall, contemplate the long history of Amuri Museum of Workers' Housing, and take an in-depth tour of Emil Aaltosen Museo. For where to stay, ratings, other places to visit, and tourist information, go to the Tampere holiday builder website . You can drive from Hanko to Tampere in 3.5 hours. In December, daytime highs in Tampere are 0°C, while nighttime lows are -6°C. Finish your sightseeing early on the 28th (Sat) so you can travel to Ahtari. Ähtäri is a town and municipality of Finland.It is located in the Southern Ostrobothnia region. On the 29th (Sun), admire nature's wide array of creatures at Ahtari Zoo. For photos, maps, reviews, and tourist information, read Ahtari road trip website . Drive from Tampere to Ahtari in 2 hours. December in Ahtari sees daily highs of -1°C and lows of -7°C at night. On the 29th (Sun), wrap the sightseeing up by early afternoon so you can travel to Sotkamo. Sotkamo is a municipality of Finland, located in the Kainuu region. Kick off your visit on the 30th (Mon): enjoy the sand and surf at Hiukka and then get in on the family fun at Angry Birds Activity Park Vuokatti. For more things to do, photos, where to stay, and other tourist information, you can read our Sotkamo online tour itinerary maker . Traveling by car from Ahtari to Sotkamo takes 5.5 hours. In December in Sotkamo, expect temperatures between -2°C during the day and -8°C at night. Wrap up your sightseeing on the 30th (Mon) to allow time to travel to Rovaniemi. On the 31st (Tue), find something for the whole family at SantaPark - the Home Cavern of Santa Claus, then see Santa Claus Office, and then find something for the whole family at Santa Claus Village. 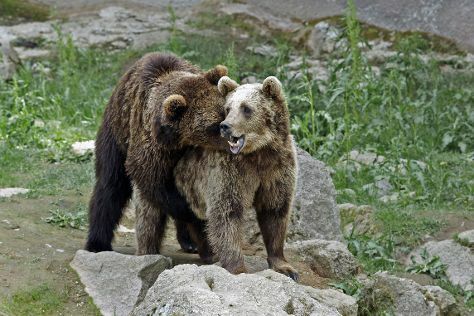 Get ready for a full day of sightseeing on the 1st (Wed): look for gifts at Your Piece Of Finland, see exotic creatures in open habitats at a safari tour, then take an in-depth tour of Arktikum, and finally get curious at Pilke Science Centre. 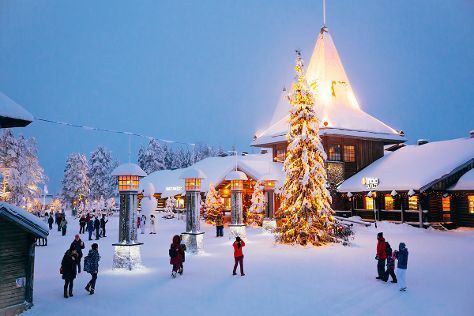 To find other places to visit, more things to do, traveler tips, and tourist information, go to the Rovaniemi tour planner . You can drive from Sotkamo to Rovaniemi in 4.5 hours. Expect slightly colder temperatures when traveling from Sotkamo in December; daily highs in Rovaniemi reach -6°C and lows reach -13°C. Finish your sightseeing early on the 1st (Wed) to allow enough time to drive to Akaslompolo. Kick off your visit on the 2nd (Thu): see exotic creatures in open habitats at a safari tour, then don't miss a visit to LUVATTUMAA - Levi Ice Gallery, and then have some family-friendly fun at Kid's Land. On the next day, ski along the peaceful trails at Levi Ski Resort. To see where to stay, maps, other places to visit, and more tourist information, read our Akaslompolo trip maker app . You can drive from Rovaniemi to Akaslompolo in 2.5 hours. Another option is to take a bus. Traveling from Rovaniemi in January, plan for a bit cooler nights in Akaslompolo, with lows around -22°C. Wrap up your sightseeing by early afternoon on the 4th (Sat) to allow enough time to travel back home.